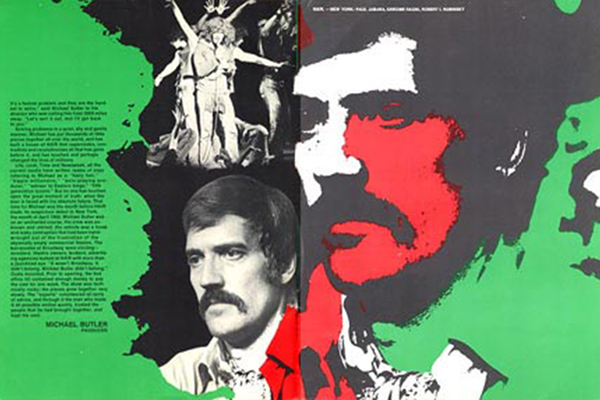 Two-page spread about Michael Butler in the 2nd program for Broadway's Hair. Butler produced the love-rock musical, which opened at New York's Biltmore Theatre in April 1968, two weeks after the assassination of Martin Luther King Jr. The 1968 Democratic National Convention would be held in Chicago during three days that coming August. The Illiniois National Guard was deployed from the Chicago Avenue Armory during the riots of that year. I spoke with 86-year-old Butler by telephone on the fiftieth anniversary of Martin Luther King's I Have a Dream speech. Of all my recorded conversation participants, Michael Butler has the most extensive connection to the land where today's Museum of Contemporary Art Chicago stands. In 1932, while his father, Paul Butler, was an officer in the Headquarter Troop of the 106th Cavalry, the armory’s first addition had not yet been built. In 1933 Paul Butler became the Captain of the unit, and as the Commander of the ceremonial Black Horse Troop, he led the way down Michigan Avenue to open the Chicago World’s Fair of that year. Michael Butler does not recall many details from that time; from his eight-year old boy’s perspective, he mainly remembered the troop’s colorful costumes, which were based on dress uniforms from the War of 1812. 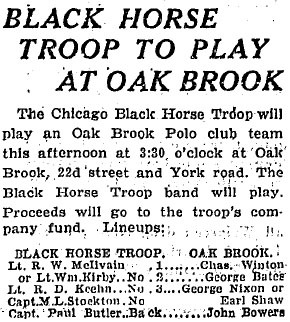 In the 1920s, during the game’s earliest days in the Midwest, Paul Butler introduced polo on his Oak Brook grounds 19 miles west of Chicago. In the 1930s, he temporarily switched his alliance to the Black Horse Troop team. 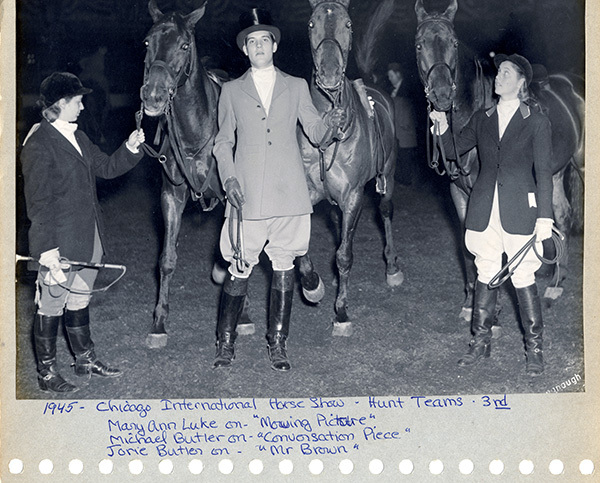 By the 1940s when the armory’s addition included horse facilities and a polo arena, indoor polo had become a spectator sport at the Chicago Avenue Armory. In my recorded conversation with Michael Butler, leading through his interactions with the armory and the activation of the National Guard during the 1968 Democratic Convention riots he recalls that he began playing polo in the Chicago Avenue Armory around 1963, “which was a prety serious period because Jack was killed at that time” referring to his friend President John F. Kennedy. Michael Butler’s next connection to the armory site happens tangentially through the deployment of the Illinois National Guard and stems from his 1968 production of the Broadway musical Hair. In our conversation Butler recounts an anecdote and its outcome that he believes is responsible for the election of President Richard M. Nixon. During Hair’s Broadway run, Butler was asked to do a benefit performance for the “Yippies.” Not knowing a yippie from a hippie, he relays that, sure, he’d do a benefit. Afterward, in a meeting with Abbie Hoffman, Jerry Rubin, and others who would become known as the “Chicago Seven,” Butler learned that the receipts from the benefit were going to fund martial arts lessons to combat the Chicago police during the upcoming Democratic convention. Hoping to thwart any conflict, Butler, with then Governor Otto Kerner, met with Mayor Richard J. Daley to suggest that the group receive parade permits and an allowance to congregate in Grant Park. Mayor Daley would not budge in his stand to control his city and the riots ensued, recorded on television and in photographs. With such a long association with the Chicago Avenue Armory, it is not surprising that Michael Butler was opposed to its demolition and land transfer to the Museum of Contemporary Art. He signed petitions and met with then Governor James Thompson to try to stop the process. In our conversation, Butler also relays other political intersections with players in the state’s government, including his own run for state representative on the Anti-War ticket. 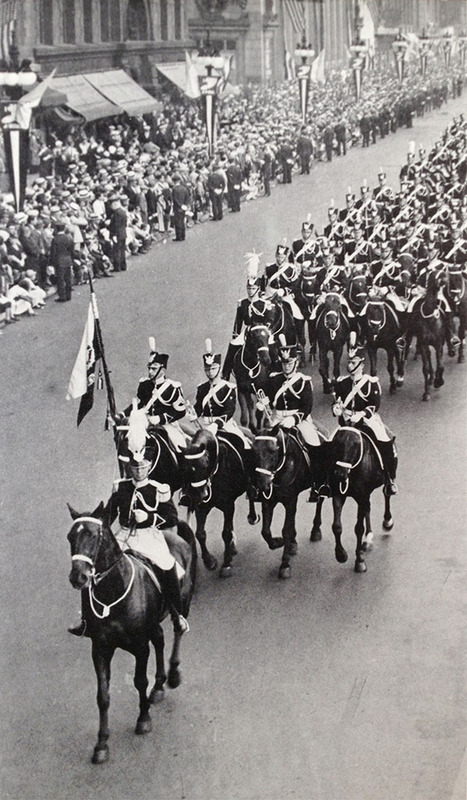 Paul Butler leading the Black Horse Troop down Michigan Avenue to Soldier's Field to open A Century of Progress International Exposition, Chicago's 1933 World's Fair. See a video clip from the parade here. Mary Ann Luke on "Moving Picture"
Michael Butler on "Conversation Piece"
Jorie Butler on "Mr. Brown"
Michael Butler's sister, Jorie Butler Kent, was also active in the horse and polo communities. Photographs on this page are courtesy of the Butler Family Archive.